The Cypress Point Golf Club (ranked #2 in the world) is located on the Monterey Peninsula between Pebble Beach and Spyglass Hill on the 17-Mile Drive. This private course has only 250 members, 75 of whom are local. Playing Cypress Point is a dream come true. After all the good golf I have played, it seems odd to call playing Cypress Point a dream come true because I could say that about any number of the courses I have played or trips I have taken. I'm a lucky man. However, playing Cypress Point really is a once in a lifetime experience. It is a tour-de-force and there is something seductive about playing here. It has an aura about it that almost no other course has, which makes it the zenith of a golfer's experience. Arriving at Cypress Point you have a real sense of occasion. Once you drive beyond the 'Members Only' sign, the sense of gravitas starts to hit you. I have generally had good weather on my golf travels and been very fortunate, although occasionally I've had to play in rain or heavy wind or cold. As the post office motto goes, "neither rain nor sleet nor gloom of night" has stopped me from playing golf. At Cypress, the weather conditions I played in can best be described as ridiculous. 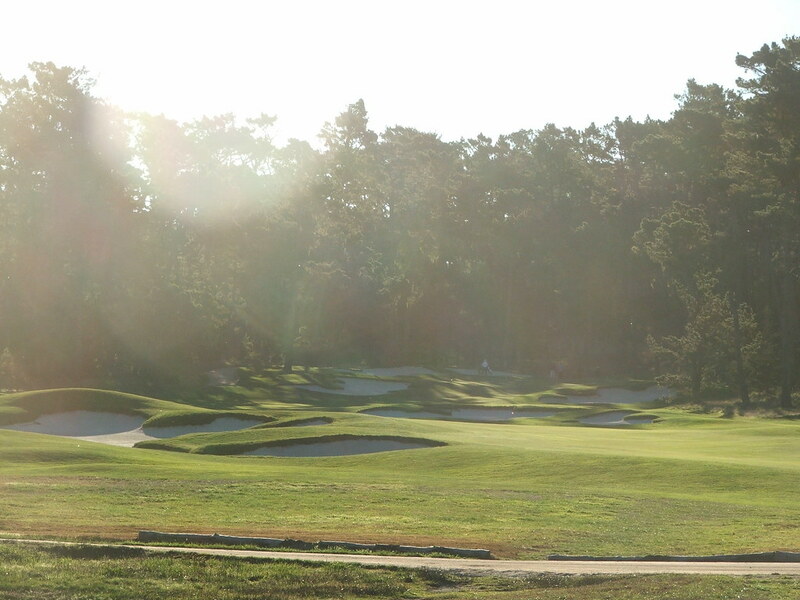 A temperature of 72 degrees with a one-to-two club wind; a cloudless, brilliant day with no fog or humidity. Pilots have a term for the weather conditions I played in: "severe clear." The visibility was unlimited. Normally I like to write all of the material in the blog myself. With regard to Cypress Point, I have also chosen to quote extensively from the works of others as well, who do a good job of capturing the essence of the place. 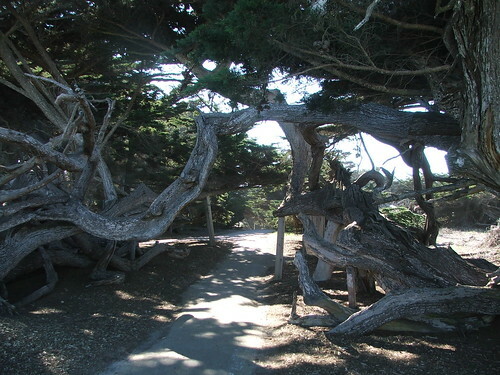 I didn't realize that the 17-Mile Drive goes right through Cypress. This scenic tourist highway meanders around the Monterey Peninsula offering stunning views. 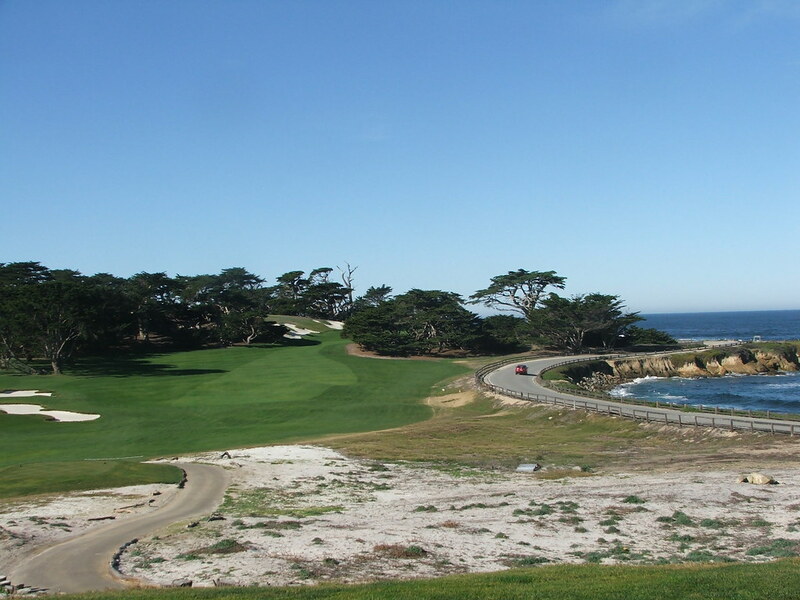 As you drive along the 17-Mile Drive you travel along a road right between the ocean and the 14th hole. In fact, you also drive right through the first fairway later down the same road. 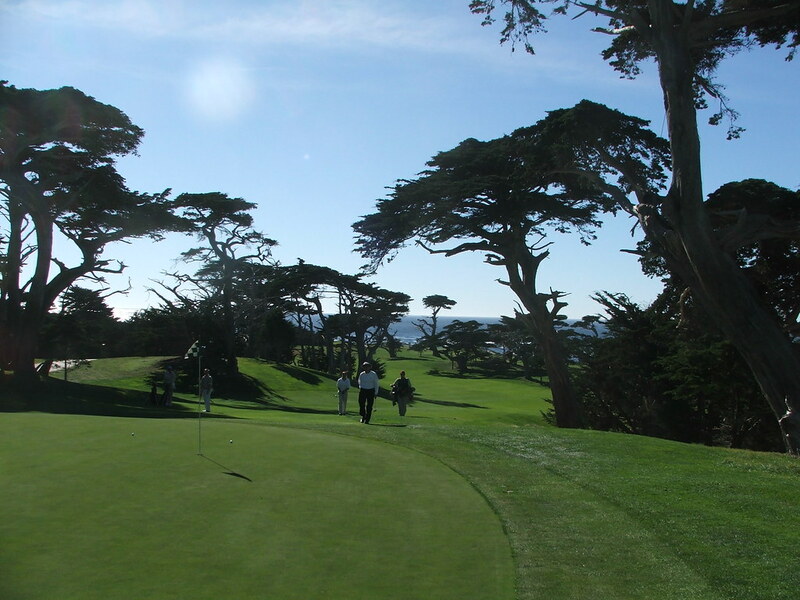 The tee shot on the first hole plays blind from the top of the hill near the clubhouse over a high hedgerow and the 17-Mile Drive, to a fairway set down the hill. 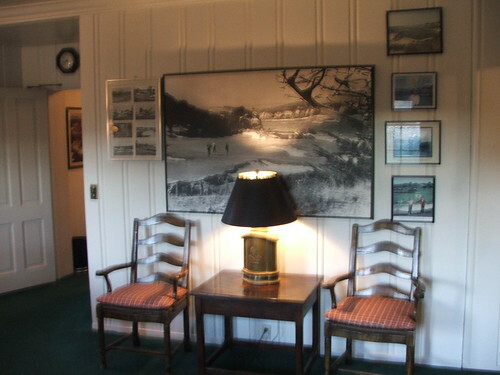 Alister Mackenzie, the architect of Cypress Point, said, after seeing the property: "It would be difficult to over-estimate the great possibilities of a golf course at Cypress Point. I am fully acquainted with the world's greatest golf courses and have no hesitation in saying that in the beauty of its surrounding, the magnificence of its sand dunes, its spectacular sea views, its glorious Cypress trees - there is no opportunity of making [a golf course] which should be superior to any other. Cypress Point has interested me more than any land I have ever had to deal with. For the sake of my reputation I should like to make you the best golf links in existence." I had the first tee jitters pretty bad at Cypress because it is such a special place, but was thrilled to hit a good first drive. The second hole, seen above, is a par five that turns inland, with a forced carry over a ravine to the tops of the dunes into a narrow landing area, because hitting too far to the right is out of bounds. The further you hit it to the left, the better off you are but brings the ravine into play. One of the many ingenious things Mackenzie did at Cypress was to use his camouflage techniques to full effect. Look at the two pictures of the 4th hole above and below. As you play the hole, there is a legion of bunkers. Notice in the picture below looking backward from the green, you can't see any of them. Almost all of the holes at Cypress are like this: a lot of intimidating bunkering that forces you to think strategically, yet no sign of all the trouble when looking back. The collection of par threes at Cypress are as good as any in the world. The par three third hole, below, gives you a great sense of how good they are. This 156 yard hole plays slightly downhill but with a cross-wind normally blowing, club selection is very tricky. Do you think any of those bunkers come into your swing thought as you play the hole? The par three 7th hole, below, is also a ridiculously good hole. It plays 170 yards uphill and at an angle to the tee box. The green is lightning fast if you are above the hole. As our caddy said of a putt down the hill: "code red." Similar to Augusta, pictures of Cypress don't fully do it justice, since they flatten out the terrain, which is fairly hilly. The 491 yard par five 5th hole, below, plays uphill. 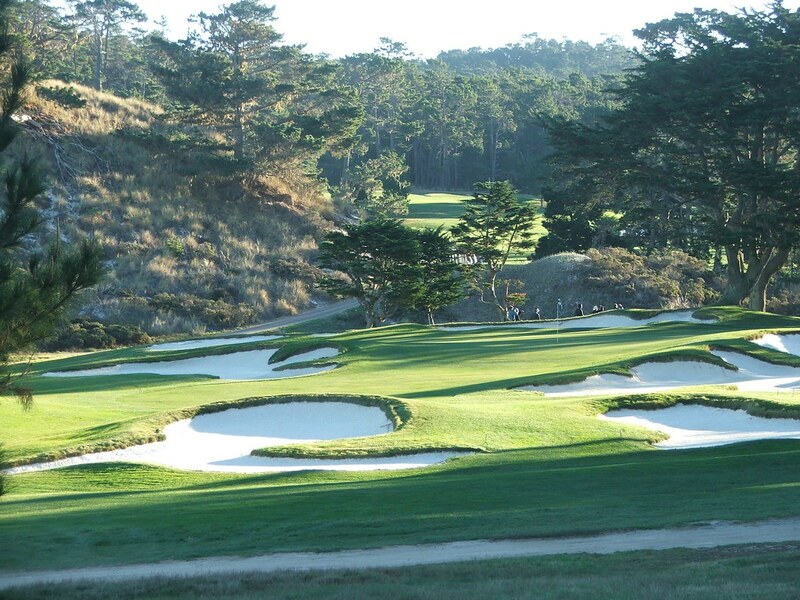 Also, this picture highlights how artful the bunkers are at Cypress. The way the bunkering was done on this hole, it looks like the entire right side of the hole is unplayable when in fact it is the preferred side to approach the green from. Again, this illustrates Mackenzie's ability to visually fool the golfer and why he is considered one of the game's greatest designers. The routing at Cypress Point is another impressive aspect of the course, with a constant change in direction and as good as any in the world. 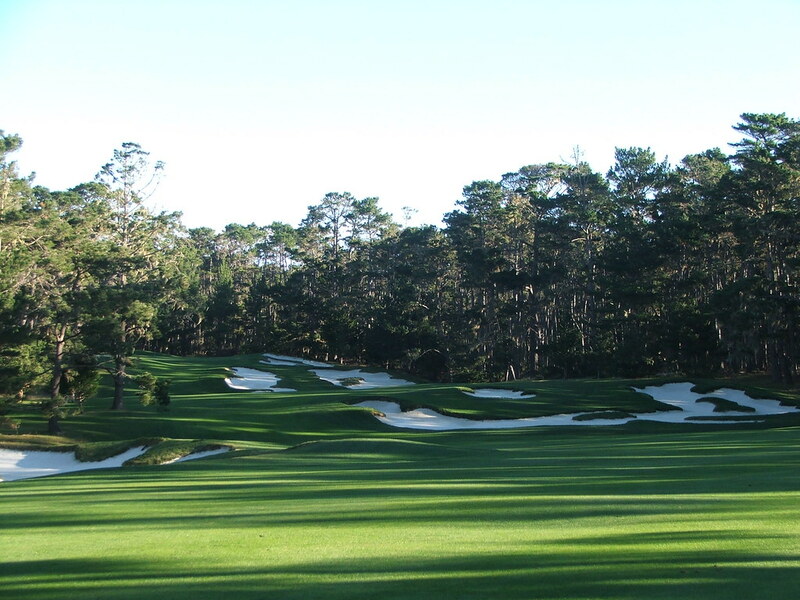 Mackenzie took a bit of an unconventional approach and broke several rules while designing Cypress Point, which is a good thing. For example, there are many elements to the course that aren't normally considered good design: back-to-back par fives (5th and 6th holes), back-to-back short par fours (8th and 9th holes) and back-to-back par threes (15th and 16th holes). There are blind shots on the 1st, 8th and 18th holes. You also have to hit over hedges (1st hole) and tress (17th and 18th holes). The picture of the sixth green below illustrates why the inland holes at Cypress are so good with the effective use of the sand dunes. On this particular green, as on several others, the slope of the green can fool the golfer who has never played it before. One of the players in our group hit his shot short of this green. The green slopes back to front and the caddies started to yell for the ball to get down, which we couldn't understand. You should want a ball to get up onto the green if it slopes back to front. In this instance, because of the grain, the ball shot to the back of the green, as if defying the laws of physics. The putt back down the green (a pretty good downhill putt) played as if it were an uphill putt. Amazing. Holes eight and nine are short par fours at 369 and 283 yards, respectively. Eight doglegs to the right and offers a blind tee shot. Once you are in the fairway and look back, there is no sight of the tee box you hit from. Nine plays downhill but to the best protected green on the course. I don't know if these two holes had any influence on Coore and Crenshaw, but they reminded me of the short back to back par fours at Sand Hills (7th and 8th). The stretch of holes starting at thirteen and ending at seventeen is the best stretch of consecutive holes in the world. It has no equal. No equivalent in all of golf. This amazing stretch starts standing on the tee at thirteen which feels a bit like standing on the 17th tee at the National Golf Links of America. That is, you're on top of the world, with the tantalizing hole below you and the azure water out ahead in the distance. Like the 17th at National, the thirteenth at Cypress is a medium length par four with great risk-reward choices. Fourteen is a world-class dogleg right hole and one of my favorites. It plays from an elevated tee to a fairway that gets progressively more narrow as it rises up the hill between the trees. Before hitting your tee shot you have to consciously focus on golf because the beauty of the scenery is so inspiring. Notice how the sculpted look of the ancient Cypress trees helps to frame the hole and add to the distinctive look. 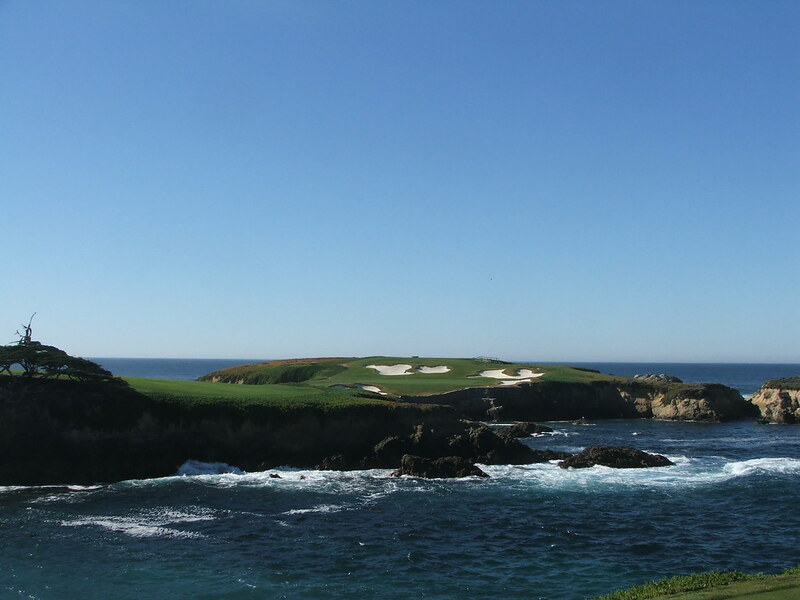 The hole plays longer than its 393 yards due to the elevation and the wind off the bay. The elevated, cloistered green is perched on a ridge overlooking the bay. 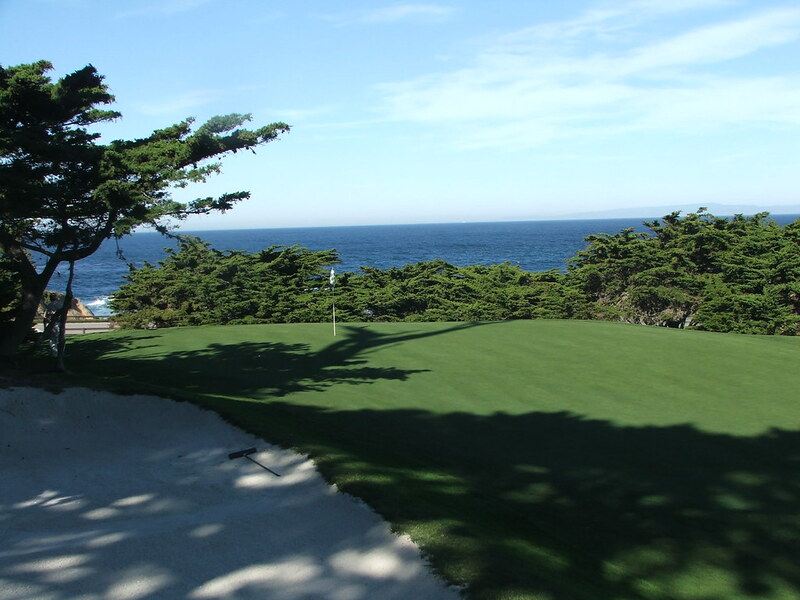 The green is relatively small as are most at Cypress Point. This picture has a particularly tricky pin placement. Balls hit to the rear third of the green tend to trickle off the back due to the grain of the grass growing toward the water. The hole is not wanting in any regard! 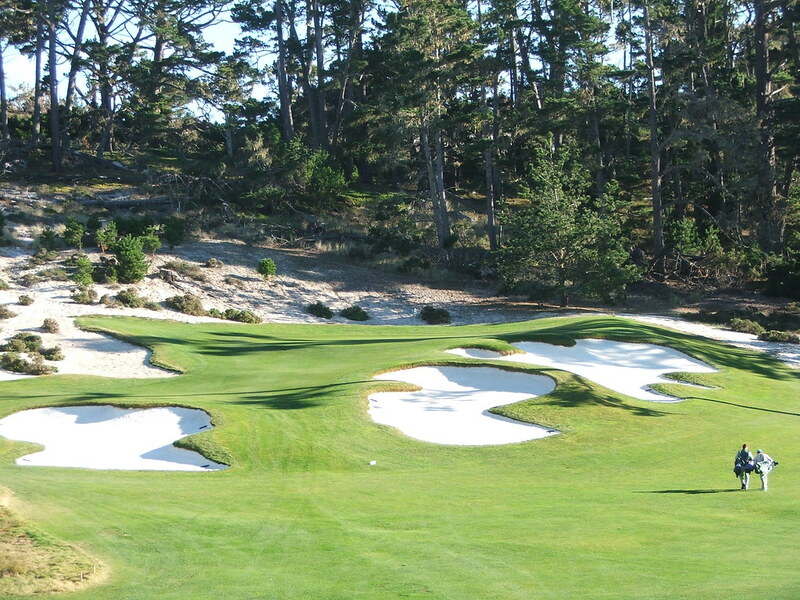 To steal a phrase from one of my loyal readers, the 15th at Cypress Point is the sexiest hole in golf. You expect to be blown away by the 16th hole because it gets so much exposure. Sixteen is one of the most photographed holes in the world and well known. The short par three 15th hole is less well known but equally spectacular, sitting in a little alcove high up on the headlands. It is beyond description tucked on a secluded ridge encircled by Cypress trees and a craggy rock formation. I know some of these photos actually look fake. But they are real and have not been enhanced or changed in any way. It really is almost too good to be true. The fifteenth hole is only 130 yards long but the green is obviously well bunkered and slopes back to front. On this stretch of the course, it is difficult to concentrate because the surroundings look almost surreal. The 16th hole is overwhelming and it lives up to its fierce reputation. The proportions of the hole are as epic as the setting. It's 218 yards of carry. As you see in the picture of sixteen, the green looks far away. That's because it is. You can lay-up on the 16th by hitting to a narrow fairway area to the left of the green. I didn't come to Cypress Point to lay up and I lost my only two balls of an otherwise good round trying to hit it, unsuccessfully. I walked away giddy about it none-the-less. The 17th hole is similar to the 18th at Pebble Beach but the bay is on the right instead of the left as you stand on the tee. You hit from a high cliff down to the fairway at an angle, over water. Because it follows one of the most famous holes in golf, it is also an underrated hole. On any other course it would easily be the signature hole. The second shot on the 386 yard seventeenth plays over the stand of trees situated in the middle of the fairway. Unless you place your drive perfectly on either side of the trees, you have to hit over them to get to the green. Jimmy Demaret called Cypress Point the best seventeen hole course in the world due to a weak 18th hole. I actually don't agree with him. I liked the 18th hole. It's a bit quirky, as Cypress can be. The tee is along a ridge backing up to the bay. You have to hit your shot over trees and the landing area is blind. The card shows the hole as being only 326 yards long, but it plays much longer because the second shot plays severely uphill. There is a big cypress tree blocking out almost the entire left side of the green forcing you to have to shape your shot off an uneven lie. The green slopes back to front and also has a couple of spots where you could end up with a "code red" putt if you're above the hole. Sound like a bad hole to you? 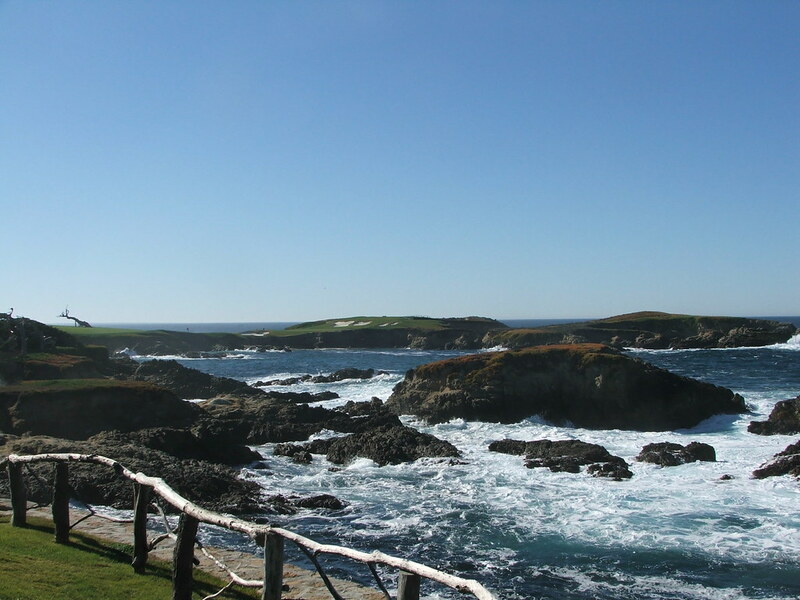 "It should be emphasized that Cypress Point possesses a diversity of terrain possibly unmatched by any other course. 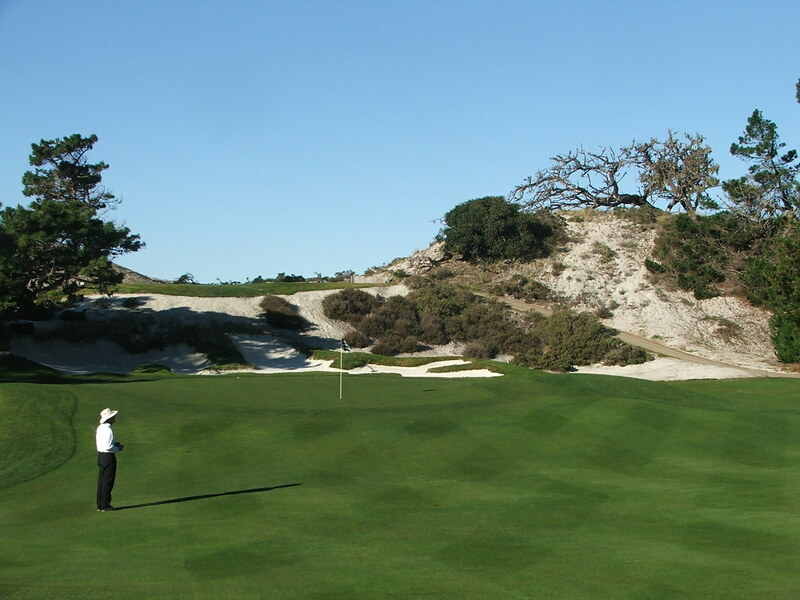 It offers not only an unforgettable stretch of cliff-lined holes but some excellent orthodox seaside holes, a few stunning dune-land holes and an arresting sequence of holes that climb inland into hilly terrain, their fairways cut through a forest of Monterey pines. 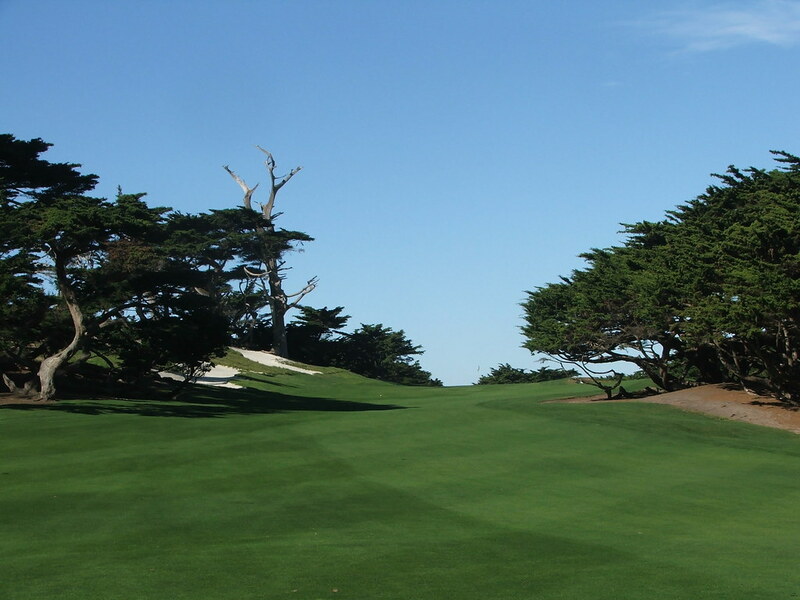 Back in 1929, Bobby Jones, who had come to California to play in the the United States Amateur at Pebble Beach, found the time to get in two rounds at the newly-opened Cypress Point layout. Asked what he thought of the two courses, Jones, with his usual acumen and diplomacy, replied, 'Pebble Beach is more difficult, but Cypress Point is more fun." 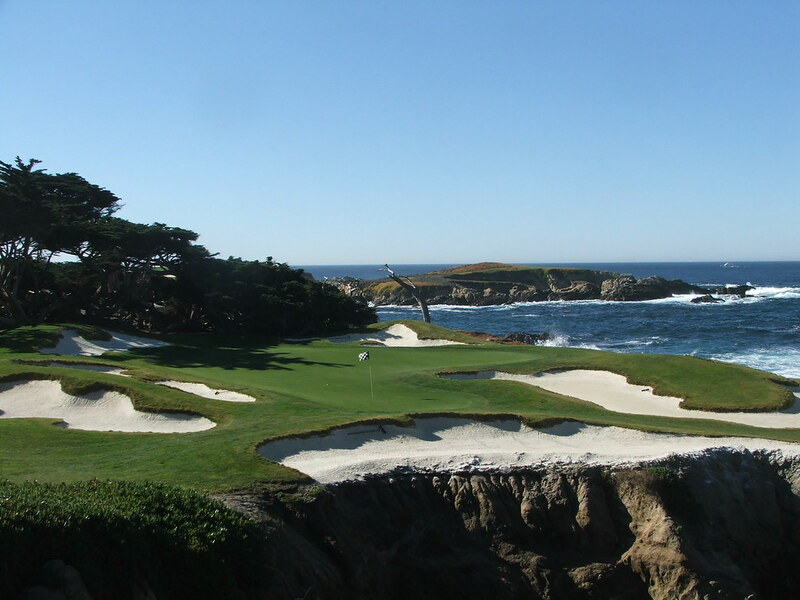 Selwyn Herson, who completed playing the top 100 golf courses in the world in 2004 sums Cypress Point up perfectly in one sentence: "Playing in heaven: Six holes in the trees, six holes in the sand dunes, six holes by the sea." If you are ever talking golf with someone and they don't think that Cypress Point ranks as one of the top three golf courses in the world, quietly take the scissors and letter opener off their desk, since they are clearly daft and you are in danger. They belong in one of those white jackets with the crossing sleeves in front. Henry Longhurst, the grand master of English golf writing, wrote eloquently about Cypress Point: "Of all the clubhouses I know, I think I should put Cypress Point in the first half-dozen. Perched up near the end of the promontory it opens on both sides to a view of the ocean pounding away on the rocks below. Inside, the simplicity is in strange contrast to the magnificence of so many American Clubs...a golf club and nothing more." The accolades of Cypress Point are all encompassing. The genius of the routing, the uniqueness of the Cypress trees, the artfulness of the bunkers, the understated clubhouse, the color of the sand, the color of the water in the bay, the ingeniousness of the traps, the views from the cliffs and the ridiculous stretch of holes from thirteen through seventeen. And, at only 6509 yards from the back tees, proof that a course doesn't have to be long to be brilliant. For those golfers who aren't as pathological as I am and want to set a more modest goal than playing the top 100 courses in the world, I offer simple advice. Try to play Cypress Point. It encompasses all that is great in the world's golf courses into eighteen holes. I have now finished playing all eight courses ranked in the top 100 located in the state of California. Did I continue my tradition while in California of having an In-N-Out Burger? As Sara Palin says, "you betcha!" I hope you will find it enjoyable and entertaining. Congrats on Cypress Pt. Looks like you got lucky with a day of good weather. This track more than any other makes California the greatest state associated with top 100 courses. I have played all the great Ca. courses except Cypress. I am way jealous. No question that Cypress is one of the top three golf courses in the U.S. As accurately described and photographed, the walk to the 15th and 16th holes is perhaps one of the best walks in golf -- or life. Truly spectacular. This is a brilliant golf course in a brilliant setting. My only criticism -- and disagreement with the author -- is that the 18th hole is tricked-up and not worthy of a finishing hole for a classic course. But how does one keep producing extraordinary golf holes in succession -- the back nine (really eight) of Cypress are amazing. I've been an avid reader for sometime and have been looking fwd to this review ever since you started your quest. On my recent honeymoon where we visited California I got as far as your 1st photo one misty morning. I daresay I'll probably never get closer than that, and I for one agree wholeheartedly that there is just something about this place that captivates you in a way that it's illustrious neighbours do not. I am delighted to read that all my research tallies with your actual experience and that also the golfing gods granted you such perfect conditions. Congratulations on playing Cypress, and thanks for confirming that it really is everything I hoped it would be. This is a wonderful, almost sumptuous, look at one of the worlds most elite golf clubs. I have played the Top 100 and Cypress was definitely one of my very favorites. It is truly amazing to stand on the first tee of such a shrine and hit your tee shot over a hedge protecting a road.. but after that its like being in a wonderland... I have had the good fortune to play it twice and would go back in a minute if invited. I have been fortunate to play many of the courses detailed in these pages and a few others that are on your list of those to be played. I mention that by way of background because I believe, as it seems you do, that there is no course as exhilarating and enjoyable as Cypress Point. I have eagerly awaited the day when you would tell us all how you thought it stacked up. For me, it was an experience that is hard to put into words. Thank you for doing it for me. Well said. I am based in Australia and have been following your blog closely for a couple of years now, each 2 weeks checking the site eagerly for the next update. Cypress Point and Augusta are the two that I have been waiting for. My general impression of the Top 100 list is that it favours old, exclusive American and British Isles courses way too heavily. For example, if the undisputed number 1, Pine Valley, were to open today and be played by all the panel straight away, with every blade of grass absolutely identical, would it go straight in at number 1? Furthermore, if it was owned by a certain plastic haired business mogul I don't think it would be in the top 20. The same could probably be said of St Andrews, Muirfield, Shinnecock and Royal Melbourne. Although they would undoubtedly climb the rankings pretty quickly they would likely start somewhere in the 20's or 30's (like Cape Kidnappers and Barnbougle) and work their way up. 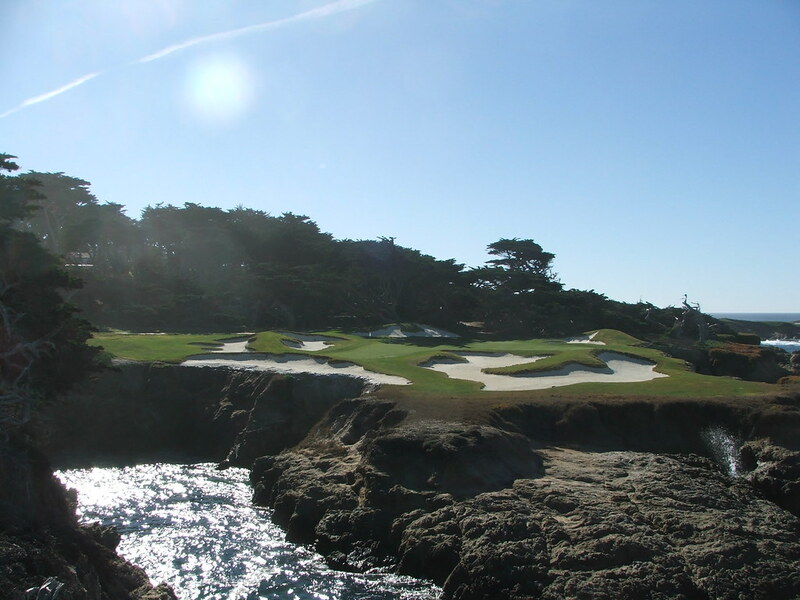 However, from your description it looks like Cypress Point would probably go straight in at number one or two. In reading the reviews of most of the other courses I was thinking mainly of how lucky we are to have so many great courses cheaply available to the public in Australia. 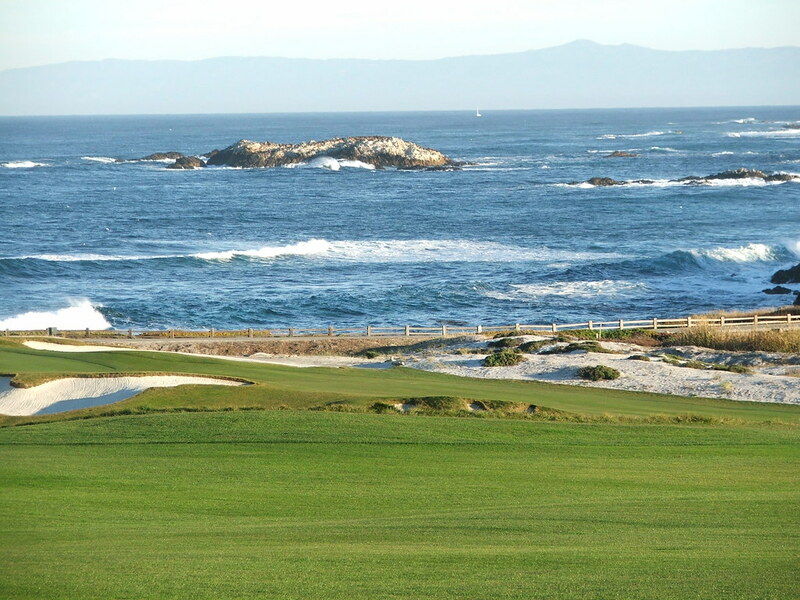 However, on reading the Cypress Point post I have realised we do not have anything that even remotely compares. Like others, I stumbled upon your site and look forward to each new posting. Awesome. I've driven down 17 mile drive and salivated at the holes you can see of Cypress Point. More than any other of your course postings, this one begs the question: How did you get to play it? With only 250 members I can't imagine finding a connection to ever get on. You are the King! Cypress Point. Wow. 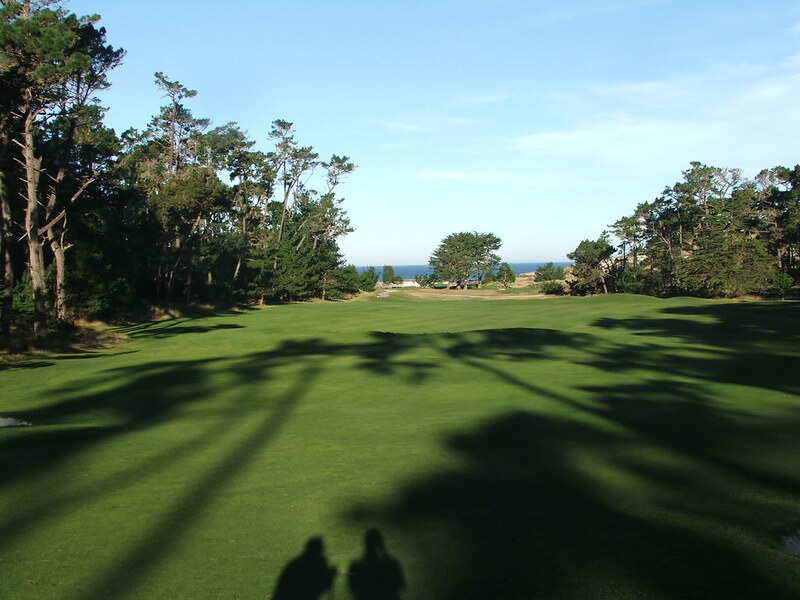 Did you get a chance to play Allistars other gem up the coast in Santa Cruz,Pasatiempo? Public but great. He called it his favorite course. I have just stumbled across your blog while not being able to sleep - I live in North Berwick and the wind is howling outside my window!! Glad you have played the West links- obviously I am biased but it should be number 1!! Very coincidental but I played Cypress on the 17th! It rained for two days solid hence the AT&T being shortened but the rain cleared on the 3rd hole and it was brilliant blue the rest of the way. Easily my favourite (sorry, UK spelling!) course. I was at University at St. Andrews and lucky enough to have played the Old over 120 times- I would get killed for saying it but I would swap them all for a chance to play Cypress again...well, maybe 199 of them. Have you heard of the Renaissance Club? It is right next to Muirfield, Tom Doak's first design in Scotland- very private but if you can get on it is awesome. Look me up next time you are in Scotland and it would be a pleasure to take you on North Berwick. i just read your write-up on pine valley, which i think easily deserves the #1 ranking, and you seemed wishy-washy. i thought Cypress (played it twice) was a tad overrated. i personally prefer Olympic (Lake) and maybe SF over Cypress. Great course but as you put it, "quirky". Like Pebble, it has a number of great holes but also some forgettable ones. IMO Pine Valley has 18 great and unforgettable holes. I'm in awe of this endeavour to play the Top100 can you please please explain how you could get on at Cypress ??? Simply know someone or a friend of a uncles, cousins aunt or what? TXGolfer - thanks for the comments. Interested guess, but it wasn't my aunt. If you look on the left side of the blogroll, there's a post called 'secrets to playing', the answer is in there somewhere. I've played Cypress twice and can only confirm that it is indeed the best course ever. 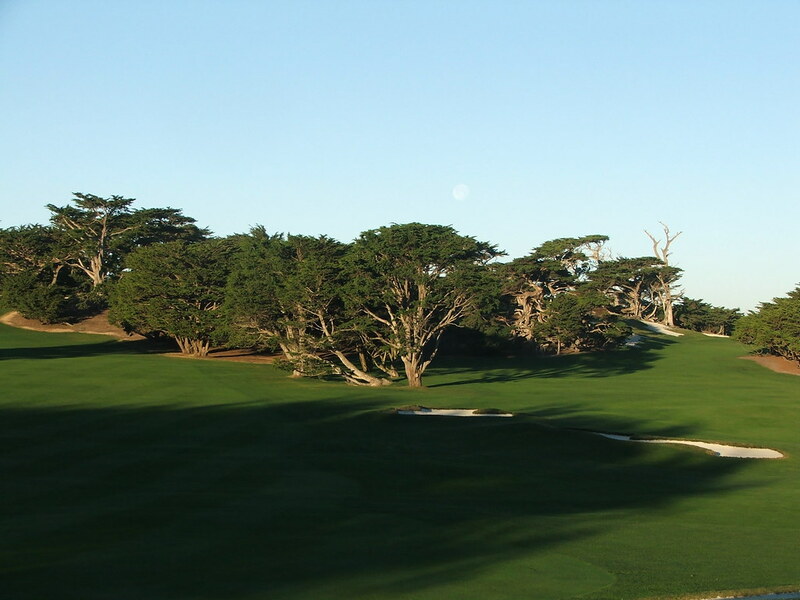 The combo of links, dunes, cypress trees and the ocean are unmatched. It's a course that can be played every day and not get old or stale. I think that "Code Red" must be common caddie lingo there for the downhill putts. My caddy Bob used that exact same phrase when I had putts above the hole that were going to be fast. Congrats on playing Cypress. A great course and on my short list of courses to play if I only had 1 round left to play. Top 100, good for you. I'm a 20 year old college student, and the recent reading of your blog has lead me to fail at least 3 tests this summer. After I read I incessantly read up more on each course, and before you know it, I don't have time to study. Is it pathetic that I spend hours watching the live course cam at Pebble Beach? Anyways to those of us who feel that playing Cypress is impossible I found this, just a story by the average Joe about how he got to play Cypress. Better to be lucky than good I guess. Cypress is my favorite course in the US, just ahead of Shinnecock and National. Particularly becuse I par'd 16 in a 40MPH wind (got there with 3wood rifle shot under the wind). SO windy that on 17, you couldn't tee up the ball without wind blowing ball off tee... 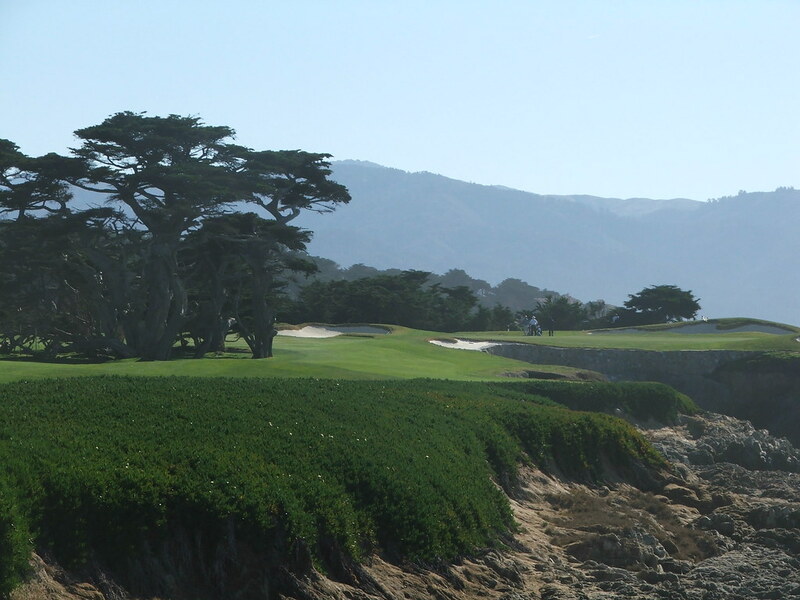 I agree with Bobby Jones that Pebble is a harder course, but that Cypress is way more fun. I look forward to playing there again on my next trip out west. 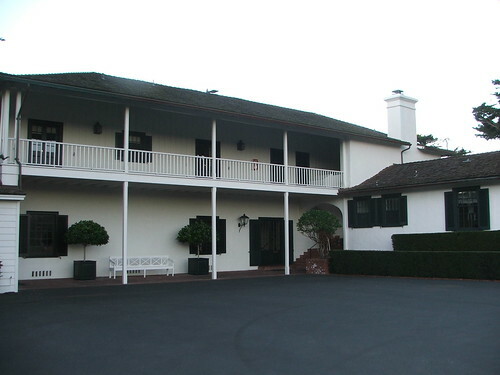 Am scheduled to make my first golf trip to Monterey area in March. Playing Cypress, Monterey Peninsula CC, Spyglass Hill, and Pebble Beach. Have played Mayacama when out in wine country a couple of years ago (and really liked it). Wanted to get Olympic (Lake) too, but they are punching the course before I get there, so will wait until next trip out. Also, Pasatiempo was on our list but they are aerating there in early March. And would love to play San Fran GC but don't have an access person for that. I just discovered your blog when on my way to play Seminole. You might be my hero! did you play Pasatiempo when in rota in CA? headed out from N.C. to play Cypress, Pebble Beach, and Spyglass Hill next week. Any suggestions on restaurants in Carmel? I've been told to have a drink at the Lodge at PB but that the food there isn't anything special. and should we take caddies at PB and SH? Usually they really enhance the experience. Congrats on getting on Cypress, you will enjoy it, best course in the world. I would take caddies at Pebble but not Sypglass. Enjoy. Cypress was so great - getting to stay there (we were the ONLY overnight guests) and dine there for multiple meals was an added priceless bonus. We played three rounds over two days. It certainly is right there with my Augusta National experience (where I also have gotten to stay overnight), FAR apart from everything else. We also enjoyed Pebble Beach but due to its commercialization and business, it was just way different. Glad to have played it once but have now "been there, done that" (particularly for $600+, including caddie fee). 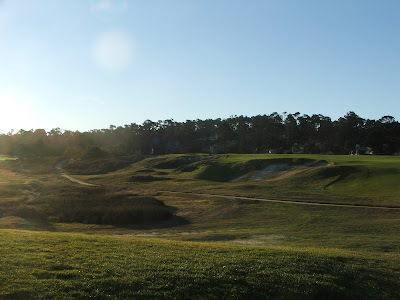 Spyglass was a great course too, but I don't have dreams of playing it again. PS: we did take caddies everywhere, and I highly recommend doing so. Just adds so much more to the experience, IMO. FINALLY! Got to play Cypress Point Club. Nirvana is the word that I will use to describe it. Better experience than Pine Valley in my opinion. The only remotely close experience is Fisher's Island, albeit Mr. Top 100 would strongly oppose my opinion on that one, however, we will not rehash our differences re. this topic. Played in 68 degree sunshine, with a one club wind. Took in the whole course from the tips. Dr. MacKenzie routing and bunkering unsurpassed. The dunes are so naturally astonishing, it almost is like they compete with stunning Pacific Ocean vistas for top of the class. I truly think there are 17 great holes, and some of them are so superior they rank amongst the best in the world. I have one thing to say about 18......F'ing weird. Number nine I believe to be the best short par four in the world.......and this is coming from a Riviera guy (see hole no. 10) and one who loves 17 at Oakmont, etc., etc., etc. My caddy strongly advised a 6 or 7 iron off the tee but of course I did not come to "lay up" so like a fool I blasted driver at the green. Hit it about 7 yds off line and left.........DEAD. made a 12 ft. putt to save my double. The dune wall is so ridiculous and difficult and the green is about six paces wide and as steep as no. 16 at Pasatiempo. What a green complex with the other dune towering above the right side of the green. BEST SHORT PAR 4 IN THE WORLD friends. I will not dwell on 15 and 16, except for agreeing with the hoards who know that the walk from 14 green to 15 tee is the most special short trek on those hallowed grounds. Nothing else comes close to rising out of the cypress trees above the 14th green and opening up your eyes to the most naturally beautiful setting in all of golf. I think that 14 and 17 are two of the best par fours in the galaxy. Shot values, asthetics, etc. are unsurpassed. How amazing are the strategic values off the 17th tee? The tree could not be more perfectly placed by the hands of God himself on that hole. The locker room is so small and understated that the term "pure" comes to mind. Only Fishers can compare with CPC's locker room for it's spartan like being. About a dozen half lockers that members triple up on with hand written names that are hardly legible is the only source of identification of the members. The hole-in-one plaque for number 16 is astonishing. There have been 21 aces to date on the world's most famous golf hole. Amazingly, only three were carded before about 1985 and 18 since. Gee, do you think equipment has something to do with that? Of course Bing Crosby had the third one. 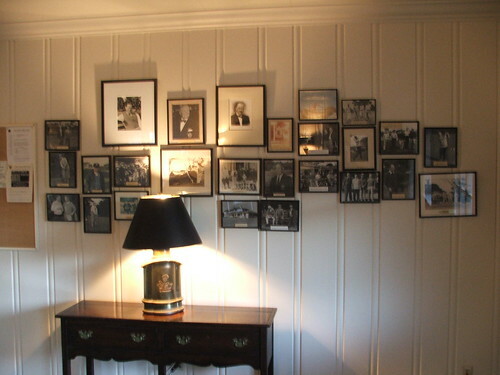 To the dude who got to stay and overnight for the weekend - I envy you, as what could be better than being upstairs in that clubhouse with the four rooms that I would argue are the best "hotel" rooms in the world? They say Eric Clapton is God. I say Dr. Alister Mackenzie is God, and CPC is the Garden of Eden. wow looks amazing my father's friend is a member here and he got to play without me and he doesnt even like golf! got to get him to take me one day looks just incredible!! I had the unforgettable pleasure of playing Cypress Point on an overcast & mild, slightly breezy August day! Walking with my 3 brothers-in-law after parring the 16th hole, I was a bit saddened by the realization that a genuinely unforgettable experience was nearing its end. I have known the joy of playing several renowned golf courses in the US and Europe, yet I am unable to say exactly what makes Cypress Point so mystical. Perhaps it's the wise & attentive caddies (thanks Vince), affable pro shop staff, quiet elegance of the course, and eye-popping vistas at every turn that combine to make it a truly great experience. I only hope I have the privilege of playing it again. I have only played Cypress once. Beautiful setting. The shot values do not compare to those at Pine Valley in my opinion although I think one has to be a better player to appreciate Pine Valley. 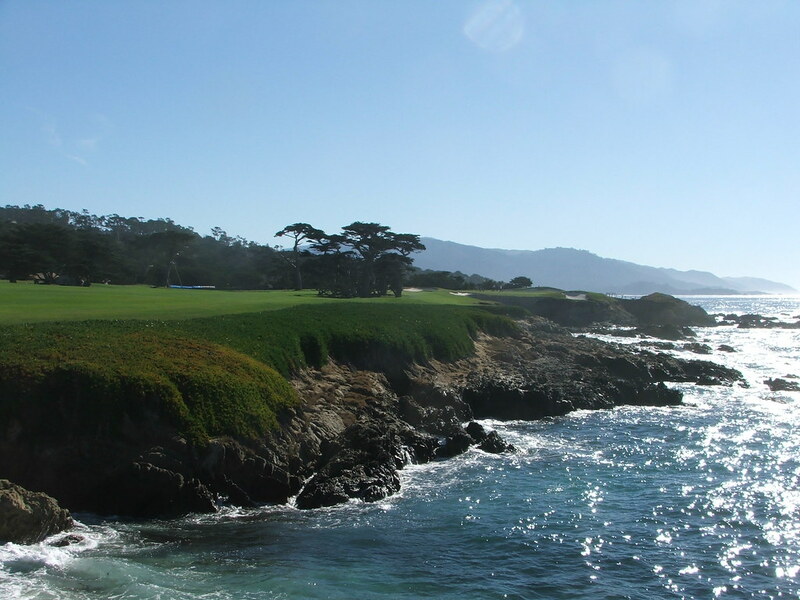 A non-golfer can appreciate Cypress Point. One thing that always come to mind when reading about people playing golf on great courses is how many completely miss the intention of the architect. First, all of these classic tracks are PERSIMMON tracks. They were not designed to be played with titanium frying pan drivers or plastic golf balls. If you play them with modern gear, you are completely missing the experience assuming you are a decent player. Also, if you are using yardages, you are missing the architectural design features set forth to challenge you. Pro driving length for 70 years was about 250 off the tee. Don't kid yourself. Respect these great tracks and play them correctly for a more honest and enjoyable experience. I was fortunate to have played Cypress yesterday. No doubt it lives up to its advertised reputation...the experience was absolutely phenomenal. I particularly loved #9 (made par with the pin tucked all the way back). Up next, SF Golf Club. Good luck to those who want to play there. I have played Cypress PT. over 20 times, loved every round! If I had to play one track for the rest of my life it would not be CPC it would be the Valley Club! I've played twice at CP and enjoyed both rounds. I'd say it is overrated though,PB is a much better course and Shinnecock and Bethpage Black are better than either IMHO. I play at Leven Links in Scotland which is a traditional links course and have played all the Open courses here.I would have Muirfield and Carnoustie (in no particular order)up with SH and BB and wouldn't give the Old Course the time of day.Troon and Turnberry are somewhere in between. Exclusivity seems to be much valued when it comes to rating courses in the States and that goes against the grain of the way I was brought up in golf,frankly,it's the actual course that is important (again IMHO)and just because it happens to be set on "pretty" piece of real estate shouldn't blind one to it's merits or otherwise. That said,we were made welcome there and I won't turn down the next invitation I get. How does one play this course? Heard it was really tough to get on. I Have a professional athlete that is very interesting in taking his buddies here. Is this possible? 75 are not local more like 15 local in the PB/Monterrey area. Maybe 75 if you include SF. First time I played Cypress we had 3 pars and one birde! and the golfer who birdied it also birdied the 15th!! !